Two Clark School undergraduate students have been selected as NCMR Scholars. 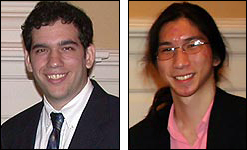 Marc Goldman, who works in the Computational Sensorimotor Systems Laboratory with Associate Professor Timothy Horiuchi (ECE/ISR), received a $10,000 scholarship, while Eric Ying-Che Chen, part of Assistant Professor Pamela Abshire's (ECE/ISR) Integrated Biomorphic Information Systems Laboratory, received $5,000. Goldman is a senior in electrical engineering, while Chen is a senior with a double major in electrical engineering and computer science. Both students also are affiliated with the Institute for Systems Research. NCMR, the National Consortium for MASINT Research, is a Defense Intelligence Agency program that provides cutting-edge research to the intelligence community. (MASINT is an acronym for measurement and signals intelligence.) NCMR's brand-new scholarship program was established to encourage future scientists to consider technical career paths within the intelligence community. The scholarship funds assist promising undergraduate juniors and seniors with tuition, textbooks, room and board. The awards are for full-time students who are U.S. citizens, and are based on academic merit in selected disciplines. Dr. Abshire, who is the principal investigator for a current NCMR research project, "Integrated Transduction, Actuation, and Control for Cell-Based Sensing," managed the University of Maryland end of the program this year. She and Dr. Horiuchi nominated the two students.